This series features craft projects for Christmas-time fun. The series starts out with gift boxes specially designed for Christmas, a tutorial for making new cards by recycling old one, and a special milk and cookie placemat for Santa. Come back in the weeks to come for more holiday crafting fun! The projects range in difficulty from VERY EASY to DIFFICULT. Miniature Christmas Tree Ornament Friday Fun - A simple cone of paper can be made into an ornament in the form of a Christmas tree that everyone will enjoy. With just a few standard supplies, you and your children can make and decorate these little paper Christmas trees. Make cones from other colors of paper to create bell and Santa hat ornaments. Christmas Tree Shaped Box - Make a novelty box in the shape of a pine tree for Christmas in either of two sizes. This is a cute gift box for small gifts that adds some Christmas cheer wherever it is displayed. The project includes instructions for making your own patterns for novelty-shaped boxes. Pumpkin Seed Poinsettias Friday Fun - Poinsettias are the flower of the Christmas season. These brooches or Christmas ornaments made of pumpkin seeds will bring out the holiday cheer in all who see them. Make one for yourself or make several to give as gifts. Grandma will especially cherish a cheerful brooch made by the kids. Recycled Greeting Cards - In this tutorial, learn how to make new greeting cards by recycling old cards. A variety of techniques are presented that make it easy to create a card you will be proud to send. Making recycled cards is a terrific group activity and is fun for crafters of all ages. Cookie Cutter Felt Ornaments Friday Fun - Simple and durable ornaments can be made with cookie cutters, felt and imagination. No sewing is required! The cookie cutters are used as templates for making the ornaments or use Aunt Annie's printable pattern with Christmas-themed templates. Christmas Pop-Up Cards - In this project, you will learn how to make a Christmas pop-up card with a Christmas tree pop-up inside. The project includes printable patterns for cards in two styles—one being fun and easy for children and the other being stylish and elegant for adults. Christmas Ornaments, Magnets and Figurines Friday Fun - See how easy it is to use Homemade Modeling Dough to make Christmas-themed ornaments, refrigerator magnets, and figurines. Use your fingers to fashion the modeling dough in fun shapes for Christmas using the ideas in this project, or come up with something new of your own invention! Stenciled Bear Christmas Cards - Make a batch of Christmas cards in a flash, featuring a stenciled Christmas bear holding a 3-D banner. Select from two stencil templates, on the included printable pattern, to cut a stencil that you use to create cards for sending to friends and relatives. Milk and Cookie Placemats Friday Fun - Kids of all ages will have fun making these placemats that are sized for a snack of milk and cookies. Just cut out images from old greeting cards, calendars or magazines that relate to the theme for the placemat and cover with clear contact paper. That's it! Simple as eating a chocolate chip cookie. Yum! Snowman and Angel Suncatcher Ornaments - Make these special snowman- and angel-shaped Christmas ornaments that have translucent centers. These suncatchers can be hung in a window, given as a gift, made into a mobile, or used as tree ornaments. Suncatchers are easy to make and are a great vehicle for creativity! Paper Angel Chains Friday Fun - Create a chain of paper angels by cutting folded paper strips. It's just like folding and cutting paper doll chains! The angels stand on their own and can be used to add some sparkle anywhere you are doing some holiday decorating! Christmas Card Set - Make handmade Christmas cards to send to family and friends in a flash! Just stamp up a sheet of cardstock and cut it into to six pieces. Add some red and green paper and Christmas-themed rubber stamps to make six totally unique Christmas cards! 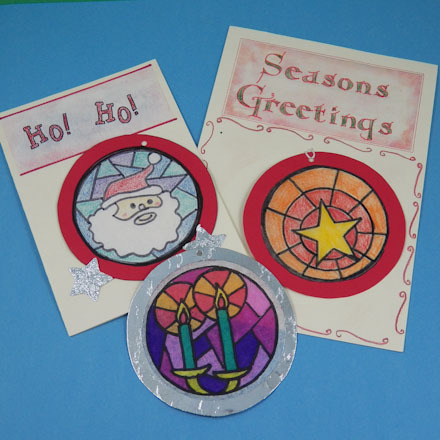 Stained Glass Christmas Decoration - Make stained glass-like medallions that can be used to decorate windows or as ornaments on the Christmas tree. This is a great family craft that the kids color and the adults assemble. Best of all, these large and colorful circular hangings can be used year after year to bring festive joy to your home! Ribbon Edge Christmas Cards - 'Tis the season for ribbons! Take your homemade Christmas cards up a notch by adding a ribbon edge. In this tutorial you'll learn how to create a decorative cut edge that is enhanced with a ribbon backing. You'll also learn how to make a stamp from an eraser and use it make plain and checkered backgrounds. Paper Medallions - Make paper medallions to decorate gift packages. The medallions are a nice alternative to bows and ribbon, and when made from foil add extra elegance to your present. There are three different medallion designs, each with two sizes. Use each size alone or make them with contrasting colors and layer the two sizes together. Festive Window Stencils - Decorate your windows in festive and colorful holiday designs with simple paper stencils. Make snowman, bell, angel, star, candle or Christmas tree stencils to use with Aunt Annie's special paint mix. The stencils are easy to make and use, and the paint will wash off the windows with ease at the end of the holiday season. Gift Tag Fun Friday Fun - Recycle greeting cards and paper scraps into fun and unique gift tags. The whole family can join in on the cutting and pasting to make these special additions to your holiday gifts. 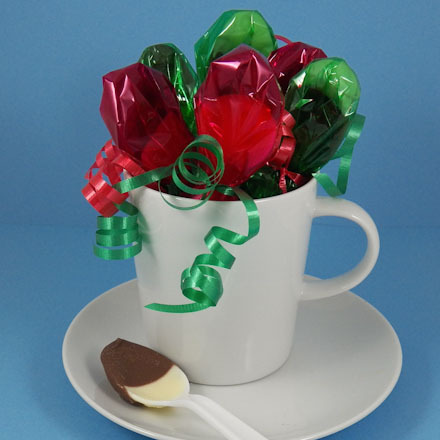 The tags can even be grouped into packages for sale at a Christmas bazaar or for a fundraiser. Little Gift Boxes - An easy to make cube-shaped box with four choices of printable patterns—quick to make in full color, a black and white version for kids to color, or a plain template to unleash your creativity. They are also be used are ornaments. 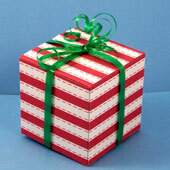 Tip: Use Aunt Annie's Christmas Stripes ePaper printed on white cardstock to make festive gift boxes. Tip: For a Christmas gift, make some Chocolate Spoons and wrap them in red and green cellophane and ribbon. Tip: Decorate greeting cards with the card-size stained glass ornaments. Make a hanger by threading a string through a hole punched in the top of the ornament. Make another punch in the card front and thread the ornament string through it. Tape the string inside of the card.